When you have a baby you have all those plans of eating out whilst on maternity leave, going to coffee shops and generally relaxing with your child. Well I hate to say this is far from the case its more of a battle ground. A battle ground where you leave feeling more stressed then when you stepped in, maybe this is just me? So here is a list of Do’d and Dont’s for eating out. DO take a selection of toys with you something or them to play with. DONT expect them to play with the toys finding salt and pepper shakers to be more interesting. DO order some food maybe treat yourself to something you love. DONT expect to eat all off it as suddenly your food looks better than theres and you have to share, also is worse with more children you have as after they have tried it you are left with not much at all. DO make sure you order some drinks. DONT think that you will end a meal with out one of the children spilling their drinks. DO take some colouring or some stickers. DONT forget to move out of the way of crayons as they are launched at your head. DONT let your children pipe up and start telling the waitress she had dull hair (this happened at the weekend my poor 2 year old I think she meant something else, maybe doll hair was a bit hilarious). DO expect the children to be excited. DONT forget to ignore the looks as your child continues to shout/scream whilst waiting for their dinners. DO make sure you are sat at a table well away from anybody humans/ animals any one or anything that can be used as a target. DONT forget to applogise when your toddler has thrown food and it has hit them (true story). DO expect children to be messy and if out with toddlers they WILL DROP EVERYTHING. DONT not pick some of it up, I always pick the stuff up from the floor or at least make an attempt I would be so mortified to leave something behind. DO expect some people will moan if your child is noisy. DONT wind the children up so they get louder (or do if they are being extra annoying) We have never done this especially that time when we got dirty looks in Toby Carvery from a group of old people. DO take complements when people say your children have behaved well. DONT get cocky and ask if they have hearing problems just take it, it may not happen again. DONT forget you will have to eat it so quickly as your tending to the kids before eating your own dinner, the standard usually is cold dinner at home so why not expect that at home too. DO pick a child friendly restaurant. DONT go somewhere posh and then be stressed to keep them quiet during the dinner, also don’t go to NANDO’S the music and lighting sends them crazy every time, sad thing is me and the hubby went there with out the children and it was rather dull without them. DO route round your bag for anything to keep them entertained. DONT rule out the old tat you forgot about in your bag to become the best toy ever at this time. DO make sure you eat out at a good time missing peak times. DONT go at peak times!!! 40 minute wait plus wait for food is enough to send a tame child to despair. 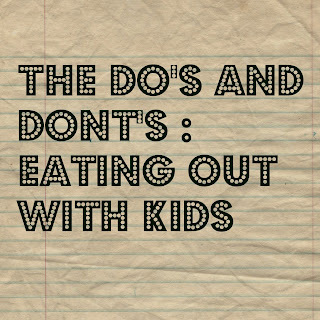 SO here is just a few tips obviously eating out can be enjoyable with children, I have had a few times where this has been possible but now there is more of them I am out numbered. 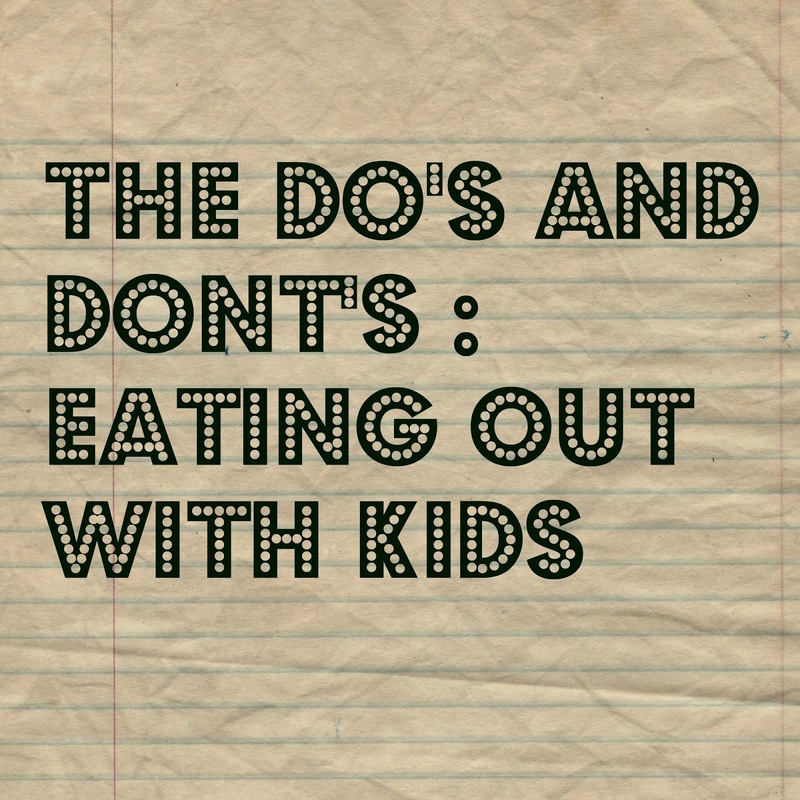 Dont forget to check out my other DO's and DONT's post they include tips for going to the Beach and Soft Play. I must say this made me laugh!!! It is pretty funny how your points are totally true. yeah its not always so bad some times! Very apt tips. I always took a notebook and pen with me everywhere when my son was little as he used to love drawing and it was a God send. I usually have rogue crayons and let them draw on napkins! I have an extra rule - don't go with your mother-in-law. It is way too stressful eating in a restaurant with small children whilst watched by someone who emanates the conviction that you are doing absolutely everything wrong!! oh yeah I can imagine! or your own mother she will let them get away with murder! ha my LG often says loudly do you have a willy mummy! Love it! We eat out very infrequently, but when I do I hate bad service. Waiting 40 minutes qhn you have kids is a no no! Oh I remember these days well! It's interesting how I still take a bag for my kids into restaurants which has in it colouing books, crayons and wet wipes and they are 8 and 12!! Habit I guess! We love eating out, but I have a two year old who is definitely not designed to sit still! Good tips! It gets easier as the children get older, I promise! Don't go to a restaurant with children plus my mother! Much too stressful!! These are some great tips to enjoy a stress free dinner out with the kids. This is brilliant. I have a 4yo, 2yo and 8month old so taking them out for food is always an interesting experience. Thanks for linking up to #SuperparentSaturday!